Race Face Performance products is a leading designer and manufacturer of performance cycling products. Based in Vancouver, B.C. Canada, Race Face has distribution in over 40 different countries. It specializes in performance cycling components, clothing, and protection. It has been in business for over 20 years. 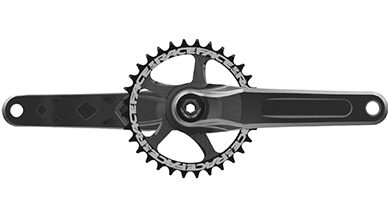 When planning its next generation bicycle crank, Race Face set out to increase the stiffness of the current version crank arm, without adding any weight. The new crank also had to maintain strength targets. “Our constraints were to manufacture in a cost effective way that minimized tooling cost and processing of each part,” noted Race Face Senior Design Engineer, Chris Heynen. Traditionally when designing new crank arms, Race Face attempted to maximize stiffness using an I-beam cross sectional design. 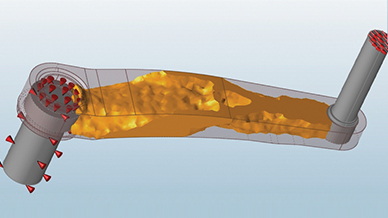 Attempts were made to optimize the crank arm at the moment of inertial at various sections. From there, Race Face would run a finite element analysis, make changes and recheck until stresses were minimized for the desired shape and weight. After discovering Inspire, Race Face realized that it could greatly enhance and speed up this design process by better understanding material placement within its designs. Race Face also quickly recognized that Inspire’s built in manufacturing constraints would help it to design for its 2D forging process. 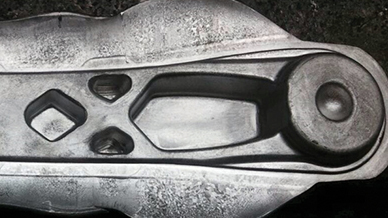 To begin concept generation for the crank arm, Race Face first imported a very rough design space into Inspire and applied the materials and loading conditions, as well as a split draw manufacturing constraint. 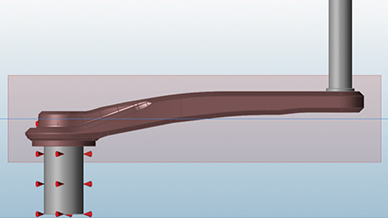 The concept generated in Inspire was significantly different than the I-beam architecture that Race Face had traditionally used. Race Face then used this updated design space to generate concepts for both maximum stiffness and minimum mass. Design and manufacture a bicycle crank with increased stiffness and strength targets, yet the same weight as the current aluminum alloy part. A process incorporating Inspire to generate the ideal concept for a forged part. Concept generation in Inspire utilizing manufacturing constraints, symmetry and draw direction. Utilization of initial Inspire results to create a new design space for further concept generation and refinement in Inspire. Creation of forging tooling based on concepts generated in Inspire. Development of a new bicycle crank design that is 25-50% stiffer at the same weight as the original part. Using Inspire for concept generation helped Race Face to greatly speed up its product design process while creating a uniquely designed product that is much stronger than its predecessor. 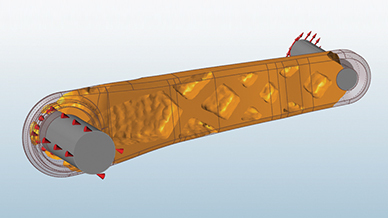 Having the ability to generate ideal concepts before starting detailed design in CAD helped to decrease design iterations, while manufacturing constraints such as symmetry and draw direction helped the team to design a part that was ready to be manufactured using 2D forging. Race Face has seen the benefits of Inspire for concept generation firsthand. Not only did it help them to create a bicycle crank arm that is stiffer than the previous generation, but also extremely uniquely designed. Moving forward, the Race Face team plans to continue to use Inspire and hopes to reduce the weight of their designs even more. Based in Vancouver, B.C., Canada, Race Face Performance Products has been designing and manufacturing leading-edge performance cycling components, clothing, and protection for more than 20 years. They are a global cycling brand with product distribution in more than 40 countries and a roster of multi-disciplined professional athletes and organizations around the world. As a company of riders who design and test on North Vancouver's infamous 'Shore', you can be sure Race Face products have endured some of the most abusive riding conditions.